The other evening, I went to Michael’s Craft Store and my daughter decided to come with me. This is a rare incident. She is the total opposite of me. She wants nothing to do with “crafts”, and she thinks that’s all I care about. She can have a major attitude at times with me:) How dare I think of things for myself…lol Whatever! Dahhhh! As if! She talks under her breath and walks away rolling her eyes. I know I’m not alone in my experience right??? While at the store, she saw those wooden monogram letters. She thought it would be “so cool” to get all the letters of her name. After some protesting, we agreed on just the letter “M”. I instructed her to pick out whatever piece of Patterned Paper from the paper aisle that she wanted (just make sure it coordinates a little with your room…had to sneak in a little teaching on color combos). For a brief moment, I thought she would follow in my footsteps. Nope. We got home and she asked me when I would have it done for her. I let it sit for a while but started to feel really bad that I didn’t make it for her. Busy, but so appropriate for a young teen girl. I really like the way this turned out. I first traced/outlined the letter on the patterned paper. Cut out and adhere to wood. I sanded all the edges with sand paper. Next, I used SU! Jumbo Outline Alphabet to stamp the name Morgan to the right of the letter. 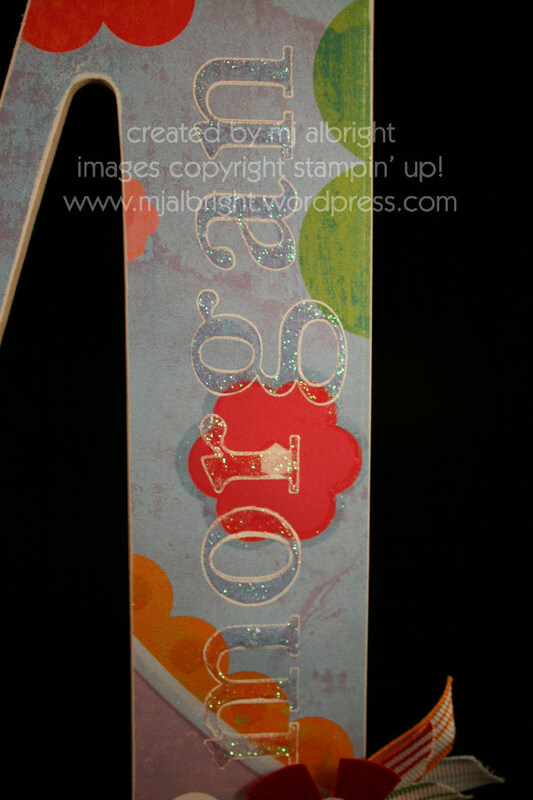 I stamped it in Craft Whisper White, covered with White Embossing Powder, heated to set. Filled in letters with Crystal Stickles (wow! the name turned out awesome IRL). Next was all the flowers. I used SU! Ginormous Flowers Stamp Set for all the flowers in this project since it kind of coordinated with the paper Morgan picked out. I used an assortment of CS for this…it was fun to combine all sorts of colors that I wouldn’t usually combine. 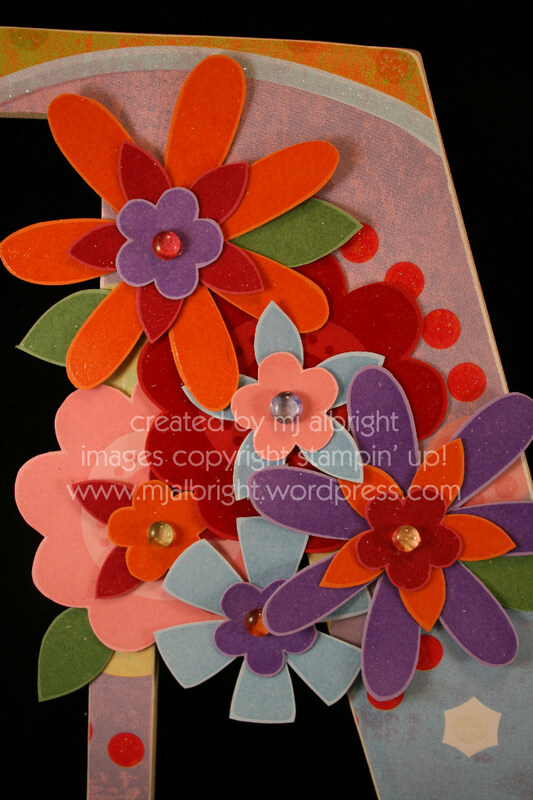 Cardstock used was Real Red, Pretty in Pink, Rose Red, Pumpkin Pie, Bashful Blue, and Lavender Lace. I just used Versamark ink to stamp all the flowers on the cardstock. I applied Crystal Clear Embossing Powder and heated to set. 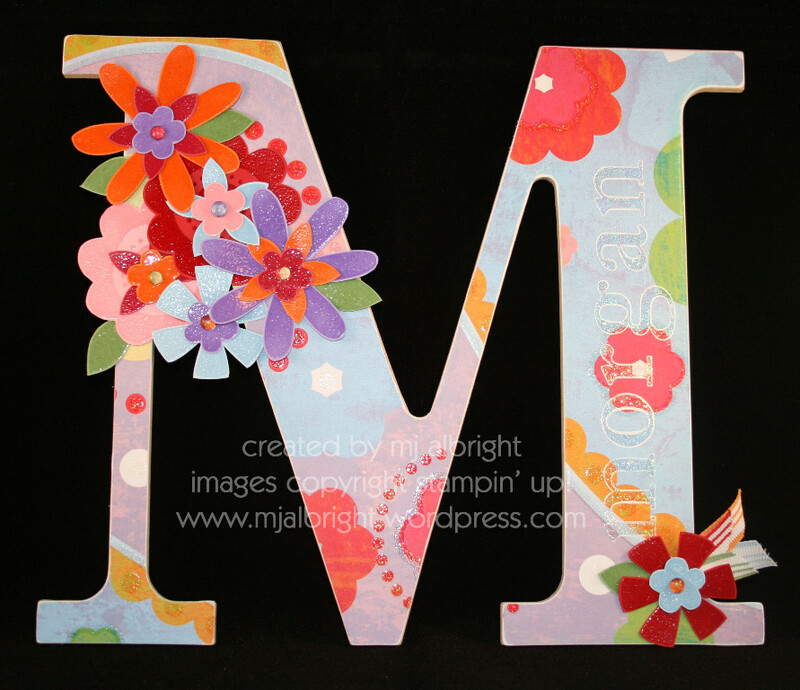 Cut out each flower and attached to letter. Added Flame & Cowboy Dew Drops to the centers of all the flowers. For the bottom right, beneath her name, I added a single flower with some Bashful Blue, Pumpkin Pie, Real Red, and Wild Wasabi Striped Grosgrain Ribbon. Oh my goodness…..hang onto your hat! I have a 24 year old who thinks the same way! But honestly, your letter is brilliant! Any suggestions on the 24 year old to SHU? (that means shut her up) LOL! This is great! BTW, I have a teenaged Morgan as well! I know the attitude well. GREAT monogram for your daughter! I was laughing reading your story! My daughter is only 8 but she already says that I love my crafts more than her…oh goodness….haha! I picked up a C for Chloe last year and it’s still sitting on the shelf. I’ve used the paper she picked out for it, long ago….oops! Hope your daughter loves this…because it’s FAB! Gorgeous – your last few post are just awesome – love them ALL! Sounds like my daughter too…but she’s 5. 🙂 Love all the flowers and sparkles! HAHA What a funny story, and an awesome letter!! The outlined name in Stickles is AMAZING!!!! This is wonderful! I LOVE her sparkly name! Fantastic monogram! I am glad your daughter sees how cool you are!!! Oh, I love this letter…especially the way you did her name. I’m going to have to give this a try. Thanks for the inspiration. I totally love that letter….and I mean like really …like that is so fly! (OK enuf of my teen impression)…I really do LOVE THAT!! SO COOL!